it when I think so much, so I decided to get up and write. My husband’s brother, was the first to live in our little slice of nature, Camp Tobacco. When I met his wife, I was amazed. She is a bow hunter. 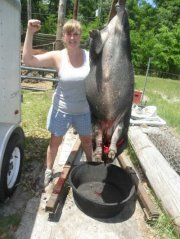 She is a hog hunter, as the picture above exemplifies her success in this endeavor. I was impressed. Not everyone can track down a hog and kill it with a bow and arrow.